Do you want to get a payday loan no matter what? There are cautions we must provide you with before you get that payday loan. We will also look at how you can get a payday loan no matter what your financial situation is. Below is a list of helpful information that you can make an educated decision from. Payday loans will have a fee ranging from 1 to over 30 percent. The average fee for most companies is 30 percent. If you borrow $100 from a payday loan company you owe them at least $130 if the fee is 30 percent. Depending on the loan amount you need you may find the APR is set up at 300 to 1400 percent. Typically the lower amount that you borrow has a lesser interest rate because the interest rate is based on risk. If the company has a smaller risk they offer a lower interest rate. This is not always true, but it does matter in giving you an average of how things work. Need some emergency cash to get you through the week? Whether you’ve got a past-due bill, an issue with your car or you need a bit more money for basics like groceries, an online cash advance from National Payday can help you get the funds you need. As a direct online lender, we can provide you with fast, simple online cash advances, with reasonable repayment plans. With our dedication to customer service, we make it easy to get the cash you need – fast. In just a few simple steps, you can get an online cash advance from National Payday. Filling out paperwork in a loan office is time-consuming, confusing and complicated. But if you choose National Payday, you’ll be able to fill out our simple, intuitive online loan application forms. We take you through everything step-by-step, to make sure you understand your loan and can get an online cash advance without a headache. We’ll need a few basic pieces of information from you, such as your current location of residence, as well as your driver’s license number, or your Social Security Number. Beyond this, we also have a few basic requirements which you must fulfill, in order to be pre-approved. You must be a legal citizen of the United States and be over 18 years of age. We cannot provide loans to minors or non-residents. Usually, your SSN or driver’s license number is enough to confirm this. You must be employed or prove a regular minimum income of at least $1,000 per month. This ensures that you will have the ability to repay your loan. You must have an open and active checking account. We use ACH transfers, rather than checks. This makes the process of getting your cash much faster but requires you to have an open and active checking (not savings!) account. If you meet these three requirements, we can guarantee your approval for a cash advance – so apply for an online cash advance today! We will usually be able to process your loan request on the same day that you apply. You will be eligible for $200-$1,000 when you apply for your first loan. If you repay your loan on time, you may be able to borrow up to $1,500 in the future. Once you have been approved, you will be notified via email. Read all the details about your loan, then accept it – and you’re good to go. Learn how to get a guaranteed payday loan here. If you complete your application and are approved before 11:40 am EST, we may be able to deposit your cash on the same day that you apply. Otherwise, your cash will be deposited into your account by the next business day. That’s it! You’re done! An online cash advance is an excellent way to get quick cash in an emergency. 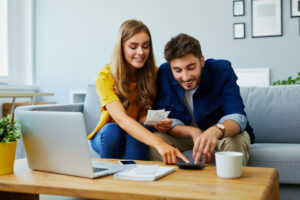 And with this simple, 3-step process from National Payday, you can get access to the money you need – without a complicated loan application process. Get started today.